The incidence of esophageal cancer has been increasing rapidly over the past decades. And due to known risk factors, such as overweight and obesity, this trend is expected to continue. When detected at a late stage, the disease knows a grave prognosis, with a five-year survival rate of approximately 15%. When the disease is identified at an early stage, the lesion can be removed by endoscopic mucosal resection. Recent studies have shown that this local treatment achieves very high curation rates, showing only 5% morbidity, 0% mortality and 93% of the patients in complete remission after 10 years. However, these early lesions are very hard to detect and are often overlooked during screening of the esophagus. 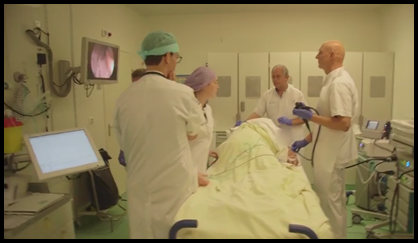 With the availability of better imaging tools, like High Definition (HD) endoscopy, the paradigm for detection these early cancerous lesions has shifted from random biopsies to targeted sampling, based on thorough inspection of the esophageal tissue. In medical literature, the visual patterns associated with these lesions are extensively described, where deviating shape, texture and color of the tissue is associated with early cancerous tissue. However, due to the subtleness these lesions and inexperience of most endoscopists with these early signs of cancer, most lesions are still missed during surveillance of the esophagus. Esophageal cancer knows two major histologic types: Squamous Cell Carcinoma (SCC) and Adenocarcinoma (AC). Although SCC accounts for most cases worldwide, AC is responsible for the majority of esophageal cancers in the Western countries. Esophageal adenocarcinoma only develops in patients with a so-called Barrett's Esophagus (BE). The figure below shows the development of a BE. In the normal situation, the diaphragm separates the esophagus from the stomach, preventing gastric acid to enter the esophagus (A). If the diaphragm widens, the stomach moves up (B) and gastric acid can enter the esophagus. As a defense mechanism, the body starts replacing the esophageal-type cells by small bowel-type cells that are acid resistant, hereby creating a BE (C). Studies show a significant increase in patients with BE, which also has a strong correspondence to overweight. Patients with BE undergo regular screening, thereby making a CAD system for finding EAC in Barrett's Esophagus very relevant.